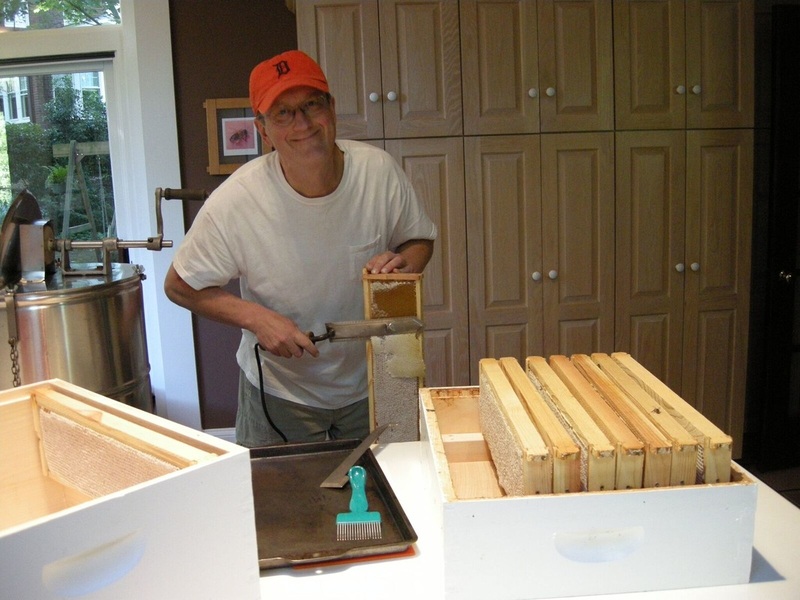 We started raising honeybees in 2001 and quickly discovered that we love the bees, love the honey, and yes, love the work. Bees keep us in tune with the daily changes of the seasons. We pamper our bees to make sure they are happy and healthy, and choose natural hive materials like wood, wire and wax simply because our bees prefer it. We stay awake at night wondering what our bees might like next. Currently, we manage about 30 hives. 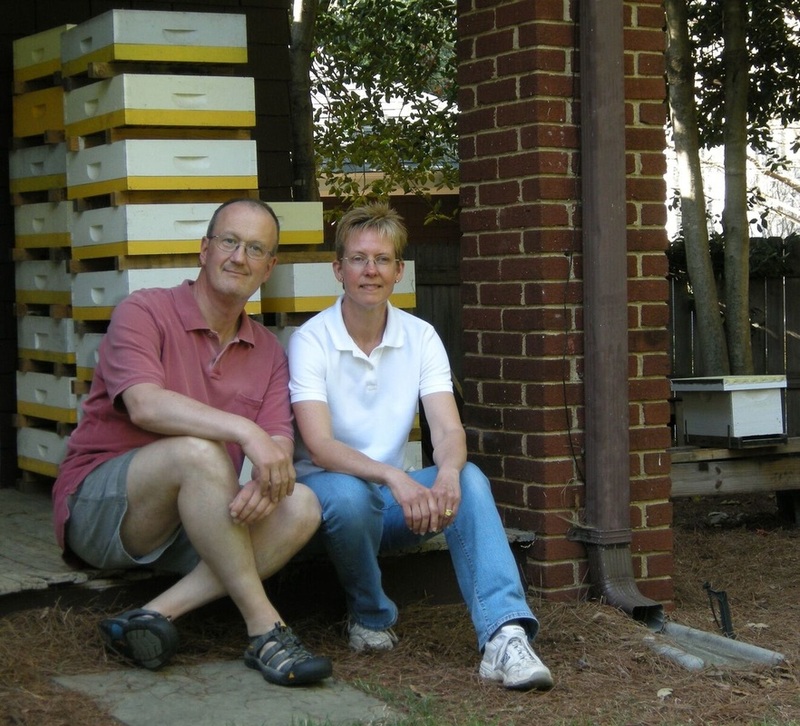 We are members of the Mecklenburg Beekeepers Association, where we help teach an annual nine-week course for new beekeepers. We assist with swarm removal, participate in community events and serve as mentors for new beekeepers. On a Saturday afternoon, you may find Libby lunching in the shade a few yards from the hives, studying the activities of busy workers, while Gerry builds new beekeeping equipment. Raw honey is simply extracted from the natural honeycombs and strained to remove particles of wax and other hive products. In contrast to commercially processed honey, it has never been heated or subjected to a super-fine filtering process which can change the taste and remove healthful properties. Commercial processing helps delay crystallization, which is why raw local honey might crystallize sooner. What’s so special about raw local honey? Flavor! If you’ve ever compared a grocery store tomato with a warm, juicy, flavorful tomato straight out of a backyard garden, then you’ll understand the difference that local can make. Commercially produced honey is made by mixing honey harvests from all across the world, including countries that don’t adhere to our standards on honey purity. Commercial honey is cooked and super-filtered to delay crystallization. Unfortunately, this cooking reduces many of the healthful properties of honey by destroying the variety of enzymes which are present in raw honey. Most noticeably, cooking and micro-filtering honey damages the delicate aroma and flavor, adding a rather bitter after-taste.Our local honey, on the other hand, retains the unique aroma, vibrant colors, and delicate flavors obtained from the plants the bees have been visiting. Whether it’s the complexity of mixed wildflowers, the richness of tulip poplar, or the heady scent of honeysuckle, our local honey rarely fails to elicit a delighted “wow!” from first-time tasters. What about the “local” honey display at the grocery store? Some of it is quite good although be advised that the grocery store definition of “local” may be a within a one-day truck trip or 500 miles from the store. If you want real local honey you have to know where it is produced, not just where it is bottled and labeled. Where are your bees located and what is the honey like? We keep our hives in the “old growth” Charlotte neighborhoods of Myers Park and Elizabeth. The wide variety of mature landscaping is perfect for bees. They adore our big tulip poplar trees and many types of hollies, as well as camellias, fruit trees, clover and the occasional dandelion. Our bees make honey that is generally light with a bit of a smooth citrusy note. Why does your honey come in different colors? Honey has a wide range of golden colors and can be almost transparent or nearly opaque. The natural color of honey comes from the nectar available within the bees’ forage area. If one type of flower blooms better than others because of rain or temperature then that nectar will more strongly influence the honey color. Our bees forage on all sorts of hollies in April and May. Holly nectar produces a very light gold honey. In May and June the big tulip poplar flowers open for business and add a darker caramel color to the honey. All season long there are clovers, dandelions and a wide variety of other flowers that the bees choose from to add to the honey. So each season the color is different! We look forward to every harvest to see what the bees brought home and display their artwork above the kitchen door. We have customers who swear by our honey for relieving their pollen allergies. Because the bees are collecting pollen along with the nectar that becomes honey, small amounts of local pollen are present in the honey, which may act as a form of desensitization against pollen allergies. What other healing properties does your honey contain? Honey is hygroscopic, or water-loving. It is a super-saturated solution which will readily absorb water from the air (keep that jar covered!) or from whatever it touches. Bacteria cannot grow in it because they need moisture to grow. As honey absorbs water it produces tiny quantities of hydrogen peroxide which is a cleansing agent. Applying honey to a wound keeps it sterile and helps kill infectious agents. Applying honey to burns and scrapes is soothing and helps prevent infection. Finally, honey is a key ingredient in many health tonic recipes, often mixed with vinegar, yogurt or even whiskey! 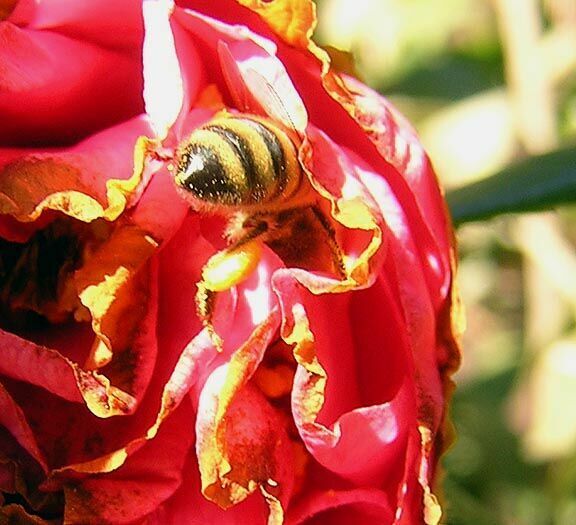 Honeybees collect nectar from flowers and carry it back to the hive. They place it drop by drop in beeswax honeycomb cells and start evaporating the water. Nectar starts out at over 50% water. Most of that water has to be driven off, so that the resulting honey will not ferment. The bees also add some enzymes and blow bubbles in the cell to stir it and help the evaporation. When the water content reaches about 17% the honeycomb is sealed with a layer of beeswax, keeping it stable and dry until harvest. What happens to the bees if the beekeeper takes the honey? Honey bees make honey so that they will have food for the winter. They are the only insect we know which, given the right circumstances, will collect more food than the colony needs for winter survival. Beekeepers manipulate the colonies so that they have a large population of workers and plenty of room for honey storage at just the right times of year when the tastiest honey plants are flowering. The bees make plenty of honey for themselves and for the beekeeper to harvest. Are your bees and honey organic? The term “organic” carries a very specific legal definition which is nearly impossible to implement for honeybees. Because bees can forage several miles from their homes an organic beekeeper must control hundreds of acres of land. In addition, an “organic” beekeeper may never use chemical medications, feed or pest control of any sort, regardless of the health needs of their bees. We choose instead to consider all our options and choose methods that are best for our bees. This means that we select natural materials—wood and wax—for use inside the hives, rather than the plastic that may be more efficient for the beekeeper but less productive for the bees. We use equipment such as screened hive bottoms and hive tops that help our bees naturally resist pests and disease. We treat for disease as necessary, using medicines only as a last resort and only when honey for harvest is not present, and work hard to provide the bees with safe, comfortable habitats. We believe that healthy bees produce healthy products. Crystallization is the natural process by which the glucose in honey precipitates out of the liquid honey. Different varieties of honey crystallize at different rates. Raw honey may crystallize sooner than commercially processed honey. If your honey crystallizes, simply place the sealed honey jar in a pan of warm water and leave covered overnight. Also keep in mind that you can eat the honey in a crystallized form - just scoop out of the jar and spread it on your toast or drop it into your tea! How do I substitute honey for sugar in cooking?